schmelzet den Schnee uns, schmelzet den Frost! brechet den Bann uns, brechet das Eis! These lines were inspired by two things: the German custom of gathering round huge bonfires to drive the winter out; and those few pagan spells in ancient German which have come down to us. The sound of the hissing flames and the crackling branches is captured in the verse. The power of winter is interpreted as a spell, an ordeal of darkness and cold, which this spell, the chant or prayer of man, can break. 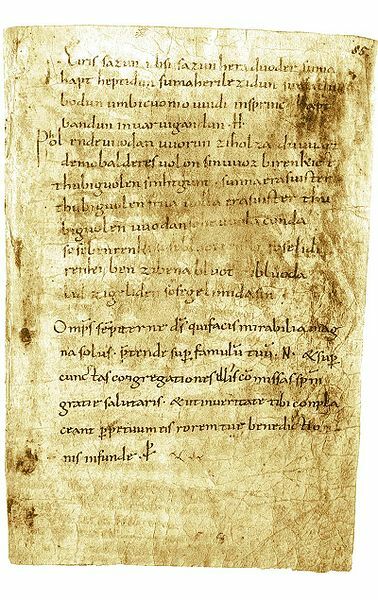 The only pagan spells in Old High German, probably written down in Fulda monastery in the 9th or 10th century AD. – Photograph: Public domain, via Wikimedia Commons. sit on the roots with me! come and sit closer by. kiss me and kindle hope! 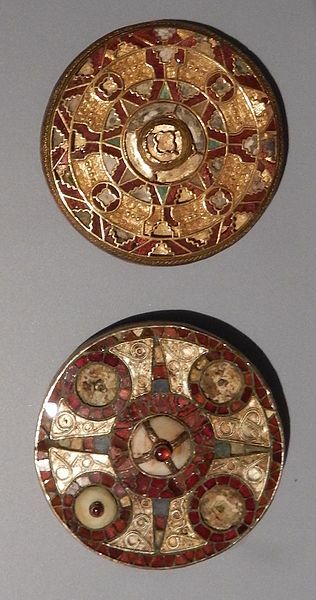 Illustrations: Anglo-Saxon disc brooches. Author: BabelStone [CC BY-SA 3.0], from Wikimedia Commons. 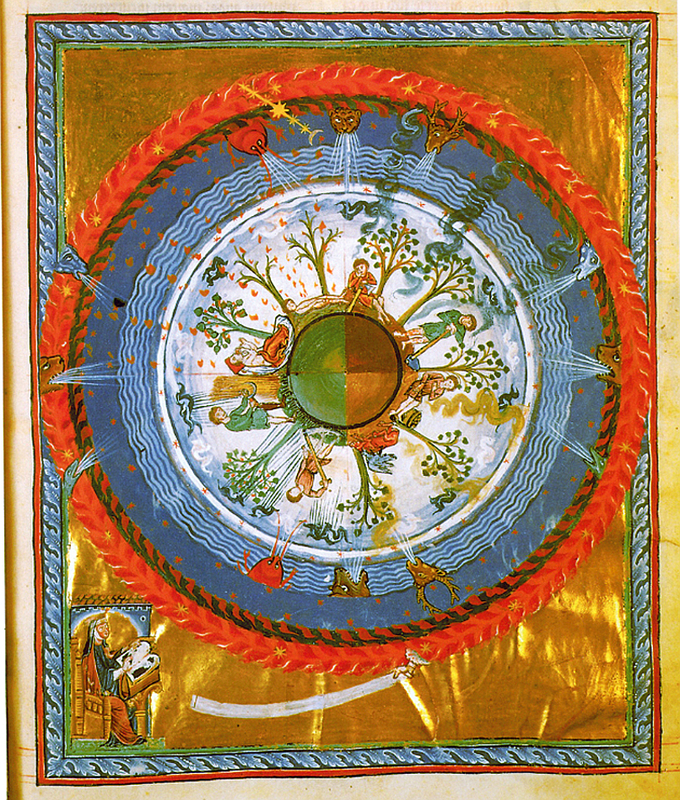 — 12th century depiction of the world, illustrating a work by 11th century author Hildegard of Bingen. ein Hauch auf der Haut, ein Traum gegen Morgen. das sich eine Auferstehung ertrotzt. golden und lockend und unbetretbar. Nebelschwaden, als wanderte man durch Wolken. ein Tor: Es führt nirgendwohin. bleibt schemenhaft. Vielleicht ist er ein Traum. entblätterten sich in den Wind, in den Wind. wird mir der Blick auf neue Höhn geweitet. den Schritt beflügeln und das Herz erwärmen? des Eismeers Zauber in die Berge bringen. One stanza of this poem is printed in the Rhönkalender 2018 with a photo from that part of the Central German Highlands; the whole poem has been published in the Münsterschwarzacher Bildkalender 2019.
sind tausend Jahre wie ein Tag. before they set glaciers ablaze. The first poem, ‘The Earth’s Eye’ describes a startlingly green and perfectly circular lake in Estonia — a timeless, mythical place, caused by a meteorite crashing several thousand years ago, but within human memory. I have also written a sonnet about the twin crater lakes of Sete Cidades (Azores). and a number of poems about the volcanoes of Lanzarote (Canaries). These haiku were written on walks around the Florenberg, a steep little hill in Germany, clothed with forest and crowned with a one-thousand-year-old chapel. The Fulda area was covered with beech-trees and oak-trees once. Summit of Florenberg in spring, seen from another hilltop. Photograph: Christina Egan © 2014. This lifeless gloom: is it the dusk? This pale white disc: is it the moon? Is this a mild day in November? the lightless first day of September. “Britain is set in the Sea of Darkness. its inhabitants brave, active and enterprising…. The memory of four clearly marked seasons, full of bright leaves and fruits, and the sorrow about the apparent confusion of the climate are depicted in My Pack of Cards.